These 2 stages also map to problem-solving methodologies used by design and engineering. Design uses a range of strategies from both stages. Intuition, and creative strategies like moodboards, form finding, and brainstorming are used to create choices. Iteration, design reviews, critique are used to make choices. Production engineering is typically a process of making choices for implementation. It uses a strategy of modularizing problems — breaking problems into smaller parts, then solving each part. It can also be exploratory. 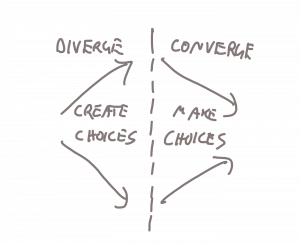 Prototyping can be a process of creating choices when you take the build to think approach.